This week @ ABC Challenges we're asking you to share your wedding or anniversary cards with us. My card is a classic black & white wedding creation with a very simple and clean layout. To see the rest of the design teams' work, check out our blog & read up on the rules so you can play along with us! After you've been inspired; you'll have until next Sunday, May 19, 2013 @ Noon EST to link your creations. Have fun & happy stamping everyone....I'm looking forward to seeing your beautiful works of art!!! i have my eye on that sentiment set! this is beautiful. black and white ALWAYS perfect for wedding cards. 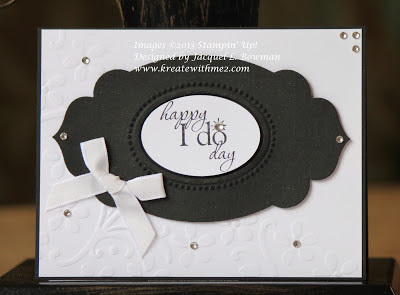 Great card - I love the black and white theme! And of course, all your bling! Elegant card! I like the die and embossing folder you used. Your card is beautiful, Jackie! This is a great challenge this week! Beautiful b&w creation! No need for images or ribbons or die cuts on this design - your choice of gems as decoration add to the elegant feel of this card! just absolutely gorgeous jackie! you pull off elegant cards so well, i'm totally jealous!! That sentiment is eye-catching! Lovely card. Love that sentiment and love the monotone - fabulous! Your card is so elegant! I need to do more black and white cards . Thanks for playing along with us at Alphabet Challenge Blog. Cute card, love the black and white colour combo. Classy, elegant, and oh so pretty!! Gorgeous, clean, simple and elegant. I love the bling!